so we have gone about 6 miles from the breakwater to the first lock. we will be traveling in the west set of locks (currently have two and are working on a third, expected to be completed in 2015). it is the norwegian sun ahead of us. they will be using the east set of locks. now the deck is positively swarming with people. unfortunately i'm not with steve or mom or gert - hopefully they are watching! 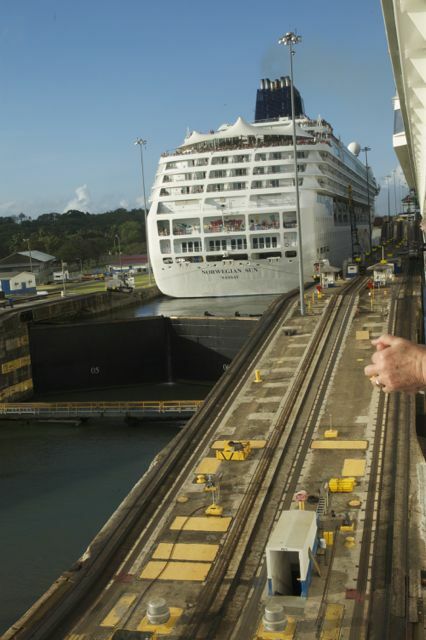 we go through the first set of locks, gatun, and then enter a lake to other locks. a few panama canal folks have boarded the boat - they take control of the boat while we are in the canal. boats go from pacific to atlantic early in the morning and so we are all going atlantic to pacific - so we can take turns in the one way section of the canal, the culebra cut. the gates of the first lock have opened for the sun. there are cargo ships in the upper locks on both sides. wow. people are three deep behind me and i'm at the top of stairs!